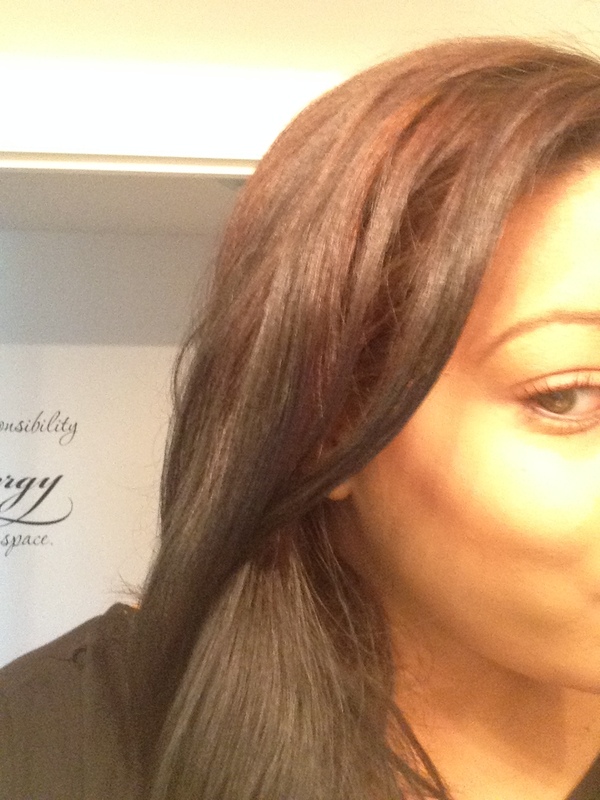 Lightening Hair Naturally… with Vitamin C! As many of you may know, dying your hair black is quite the commitment. Even though it is not far off from my natural dark brown hair, there is just something about black dye that grips to your hair and holds on for dear life. I dig black hair, but I get bored easily. So, I attempted to lighten it a couple of times on my own. No change, still black. I should also mention that I am not willing to strip or bleach on my hair to lighten it. It’s not that serious. Just for the heck of it, I hit the internet looking for some natural hair lightening tips and tricks. Lemons, honey…I had heard it all before. Then I stumbled upon a DIY hair lightener that I had never seen before. I decided to give it a try, and of course I’ll be sharing my experience here. Apparently, vitamin C can be used to lighten hair. Who knew? Not I. So, I whipped out my trusty NutriBullet to create a concoction to lighten my hair naturally. I used vitamin c pills that I bought from Wal-Mart for 6 dollars. You do not want to use the chewable ones. I am not entirely sure why not. But, the internet advises against it…and the internet knows all. 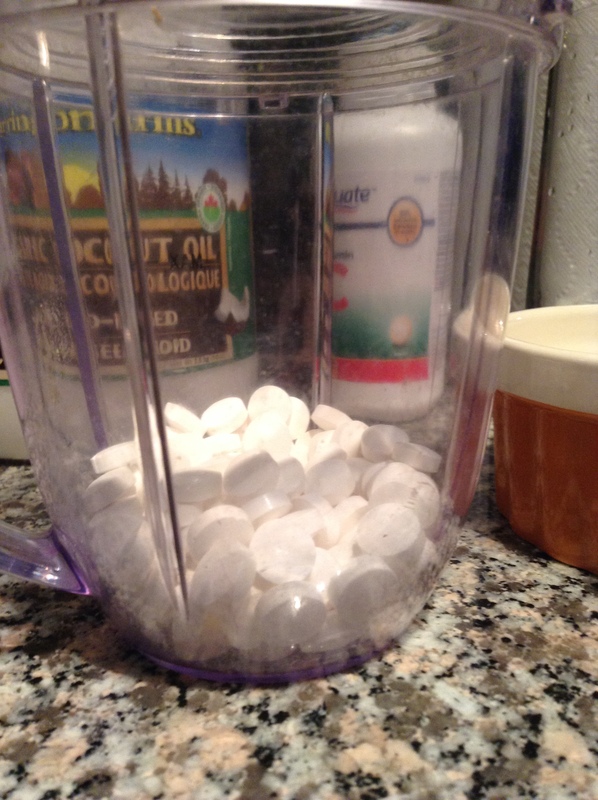 I put about 100 pills into my NutriBullet, and using the milling blade, blasted them into a fine powder. 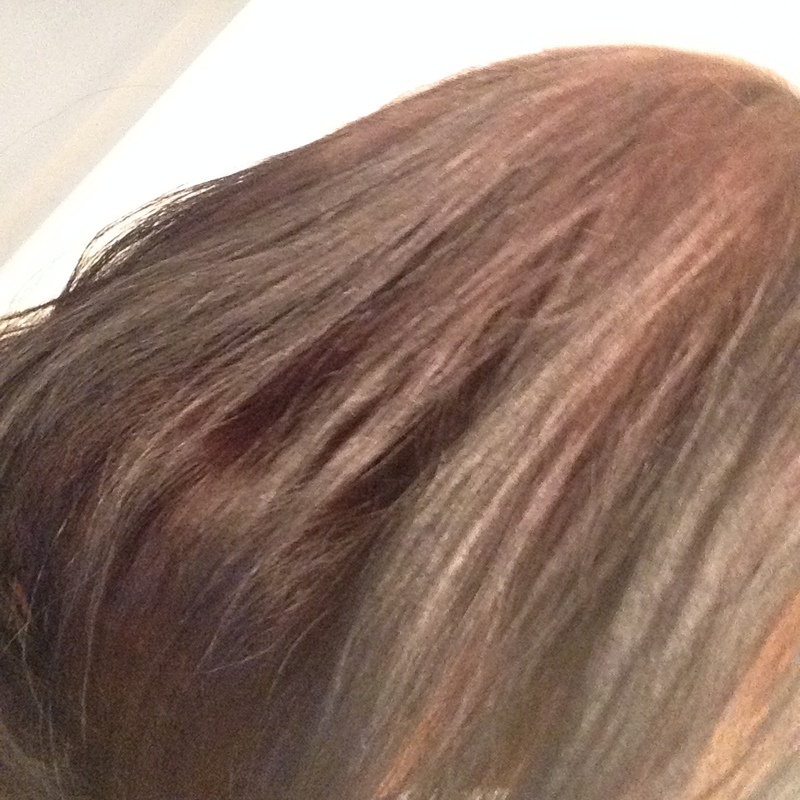 To this, I added about two table spoons of shampoo and two tablespoons of extra virgin organic coconut oil. 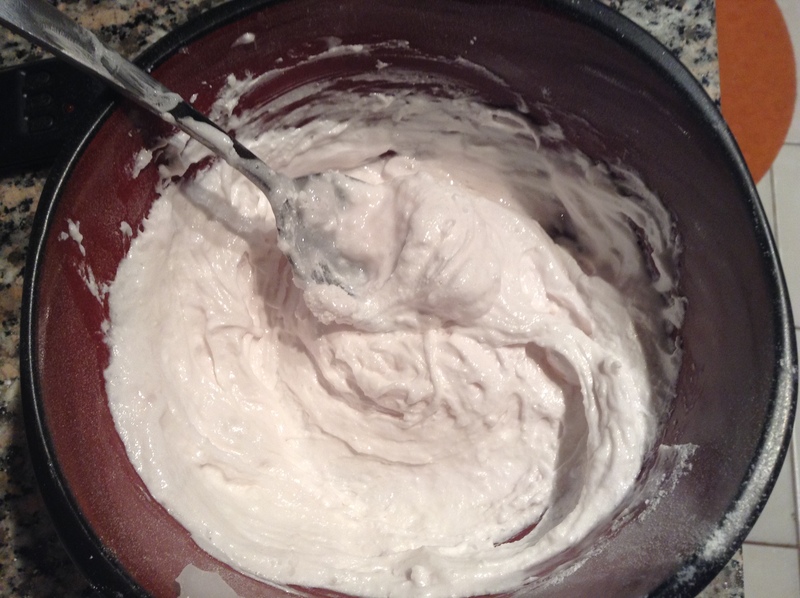 The mixture will look like a thick white paste. I applied this to my wet hair and then wrapped it in a very fetching grocery store plastic bag. There doesn’t seem to be any set about of time that this treatment is left on the hair. Some people online left it on for a few hours, and others left it on overnight. Since it is natural, I felt fine about leaving it in overnight. So, I went with that. 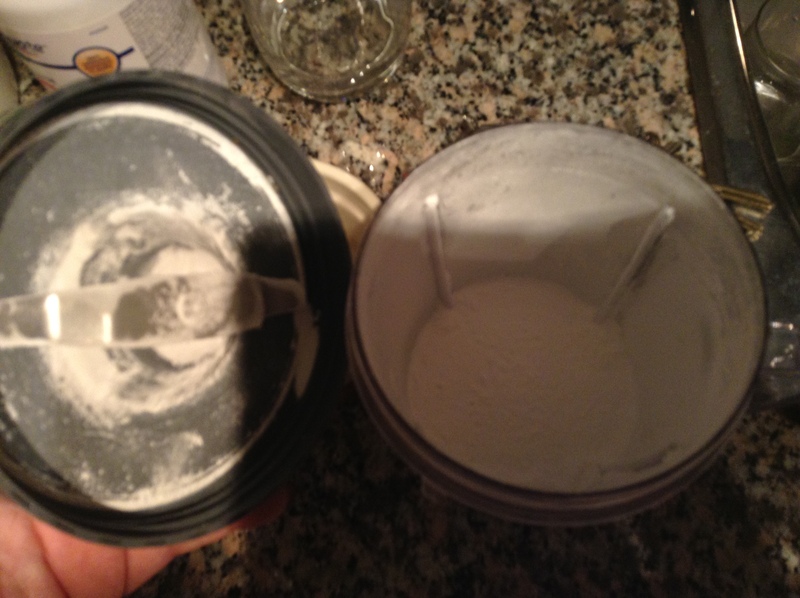 Because the mixture is so thick, it didn’t drip or slide around and my bag stayed in place until morning. In the morning, I rinsed out the mixture and dried my hair as usual. I noticed that it had definitely lightened my hair a bit at the top. The bottom part was still, pretty much black. Although I do think that it may have been a softer black than before. I think it was really effective at bringing out some of the lighter tones, so my hair kind of appeared to have subtle highlights in some lighting. It may not have been obvious to anyone besides me. My hair also felt great, it looked glossy and healthy, which I would attribute to the coconut oil that I added to the mixture. So, I would say that the vitamin C method would be worth a try for anyone wishing to soften the look of their hair a bit. The fact that it worked best on the areas of hair near my roots suggests that it may work best on virgin hair that has not been processed or coloured. You’ll recall I said that I get bored easily? Well, I have since dyed my whole head of hair a dark brown, but I will definitely be revisiting this method again to get a softer look next summer. If you have tried using vitamin C on your hair to lighten it, I would love to hear how it worked for you. What other natural concoctions do you use on your hair? Naturally I was distracted by your contouring skills. Great advice, thank you. I’ve tried this a few times and I think if you use a dandruff shampoo or a clarifying shampoo and don’t add any oil, it strips the color better. I saw an article that suggested following up with conditioner and honey and sleeping in it for softness. I’m going to try that tonight. I use 1000 mg of the effervescent vitamin c and mix it with dandruff shampoo, lather it through my hair, put a bag on my head and rinse after 20 minutes. My hair is extremely over processed so I’m afraid to do any more than that at a time. It’s lightened up a good amount. After I condition it, I add coconut oil to my hair and leave it in and wait to wash it for a day. It true i did it before without the oil and once with the oil. It lightens better without the oil but your hair will be so dry. I guess it depends on whoever it doing that and what they would rather do. For some it maybe easier or better they just condition after and out the oil after while some will rather put the oil in the shampoo. Vitamin C definitely works but I don’t know how light it can get if I use more times and whether I will get rid of the orange undertone. I have highlights in my natural brown hair, but since it’s nearing summer I wanted to lighten it. Going to the salon is just sooo expensive so I thought I’d try a DIY. I keep seeing tutorials on stripping dyed hair; but would it lighten my highlights and natural brown hair? Your hair looks very natural & pretty, espec. in the photo on the left. Looks like a success to me! I like the subtle variations, & it looks soft & healthy, natural.